Even with all the rising tension and obvious Drama, the Housemates still won their Wager. After days of intently rehearsing their play, Angel egging them on every step of the way, Khloe asserting her authority as Head of House and compliance from most of the Housemates, victory was finally theirs. The play was an illustration of a very typical Nigerian situation, something that would happen every day and with gusto, they managed to pull it off. Everyone went the whole hog, from costumes, to music and a clear effort, there was no way the Housemates were losing again. They won their 50% Wager and a roar of ecstatic cheer lit up the room. Just before the Housemates found out about their win, Biggie called out Lolu and Cee-C for their obvious bad behaviour. They were both scolded and given a double strike which left many of the other Housemates gobsmacked. 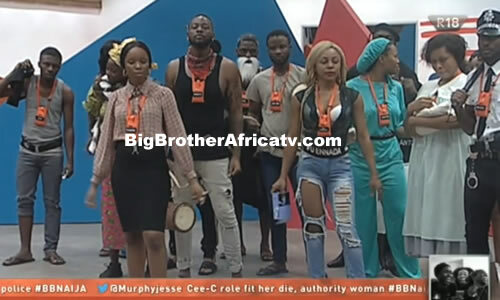 As the celebration reigned, both Cee-C and Lolu stood still with dead pan looks on their faces. Shook to their core. Aside from the obvious shock over the incident with Lolu and Cee-C the rest of the Housemates were absolutely overjoyed with their win. It was much needed as this is their first time inning a Wager and after two losses in a row, endless challenges and mounting tension, this is the motivation the needed to get their heads back in the game. Khloe was noticeably elated as the Wager was won under her rule as Head of House.